Status Reports sum up the progress made in developing our online game, Tau Station. Since the start of the Closed Alpha, update changelogs list all changes to the prior game version. Furthermore, this blog section contains Special Episodes, which are articles about extraordinary topics. We use these posts to share very special insights with you, in addition to our regular topics. Special Episodes can be recaps about events such as trade fairs, panel talks, or even some personal words from team members. Lights out, spotlight on! It’s time to talk about another useful Community contribution. This one offers useful advice and info to all Citizens for free: the Tau Station Wiki. 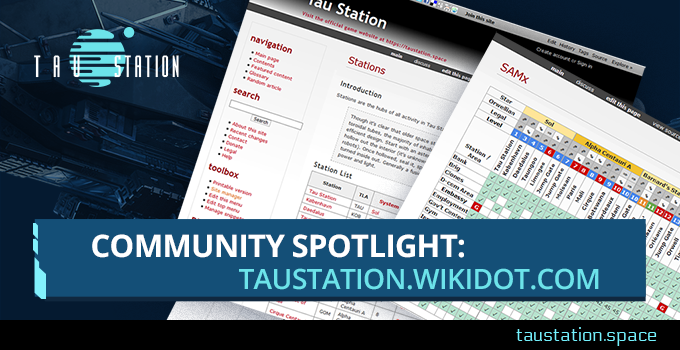 ➔Continue reading "Community Spotlight: taustation.wikidot.com"
Citizens of Tau Station, welcome to your latest game update! Latest goodies include two new missions, UI improvements in the form of revamped feedback messages, and lots of new item art. Read on for a full account! ➔Continue reading "Update Changelog 2019-Apr-18"
Welcome to our first quarterly status report. It’s time to review changes in Tau Station from January, February and March 2019! 5 new missions and the YZ Ceti system, with 4 stations was added. Bodyguards are now at your service; the game’s beginning has been improved for new citizens; and there are 89 new item images, plus 40 brand new epic items for Syndicate Campaigns. Lots of new University courses, the bond log, and various other improvements were also added. Last, but not least, there’s a new dedicated section in your CORETECHS for the Citizen Council. 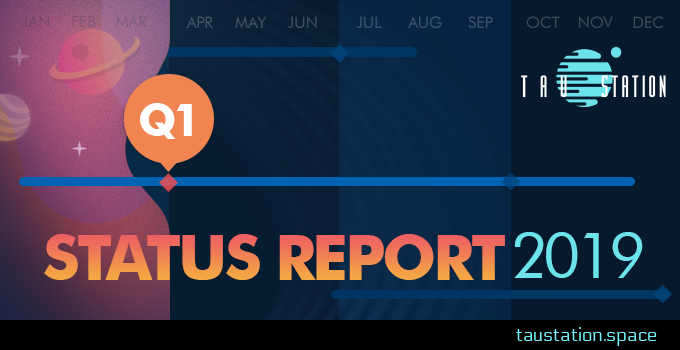 ➔Continue reading "Status Report Q1/2019 (Jan-Mar)"
The latest release updates the Citizen Council page, presenting the recent election results. As requested, a bond log is now available in your information panel, there are 2 new missions and a batch of 30 items has new artwork. When buying from NPC Vendors, all adjustments to the final price are displayed (with reasons) before performing a transaction. University course enrollment is shown on the main University page so this important detail is now visible on first sight (no longer only on the class detail pages). Last but not least: Bodyguards have arrived! Check out the nearest Security area. 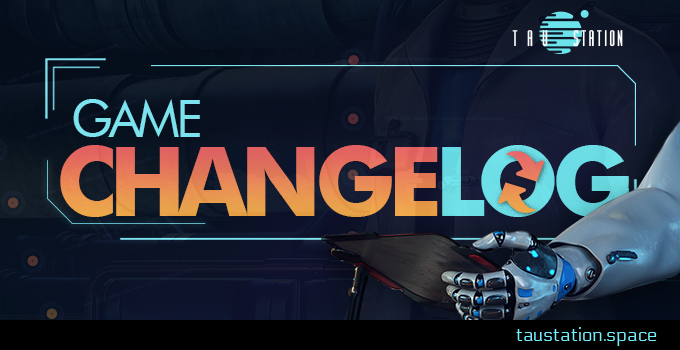 ➔Continue reading "Update Changelog 2019-Mar-19"
Greetings citizens! Today you can decide which Citizen Council candidate you want to support. Read on to see all facts on the election process. You will be able to vote until 201.42/00:000 GCT. Good luck to all the candidates and thanks again for your willingness to invest your time for the good of our Community. 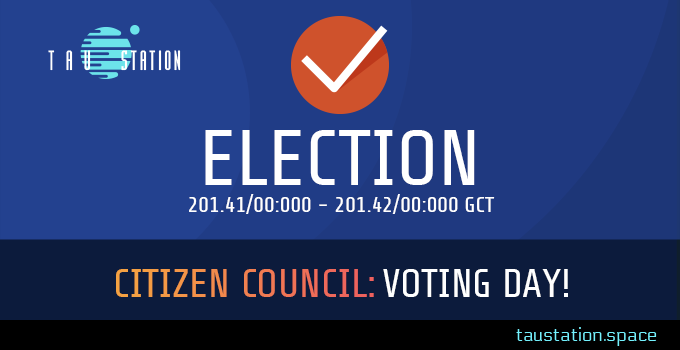 ➔Continue reading "Citizen Council: Voting Day!" With today’s post, we conclude our series showcasing all 12 candidates for the first Citizen Council. And please save the date; the election will be conducted on March 15th (Friday). ➔Continue reading "Citizen Council: Candidate Profiles (Part 6)"
The first Citizen Council election is fast approaching! In the meantime, we still have 4 more candidates to present for you. 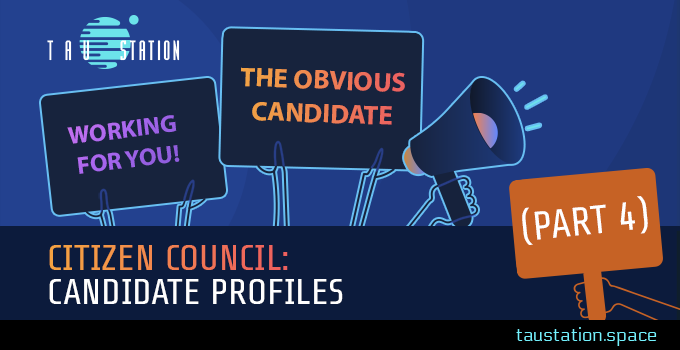 ➔Continue reading "Citizen Council: Candidate Profiles (Part 5)"
Two days have passed since we presented the third batch of candidates for our Citizen Council. It’s now time to introduce two more interesting applicants who would like to get your vote(s) in the election on March 15th. ➔Continue reading "Citizen Council: Candidate Profiles (Part 4)"
Greetings! Today we will continue our series presenting the twelve stellar Community members who have applied to become members of the first Tau Station Citizen Council. ➔Continue reading "Citizen Council: Candidate Profiles (Part 3)"
We’re coming closer to the first Citizen Council election in Tau Station! The verification of applications is over and we’re happy to start the final phase before the elections happen on the 15th of March 2019: in the next 2 weeks 12 candidates will present themselves to the Community. 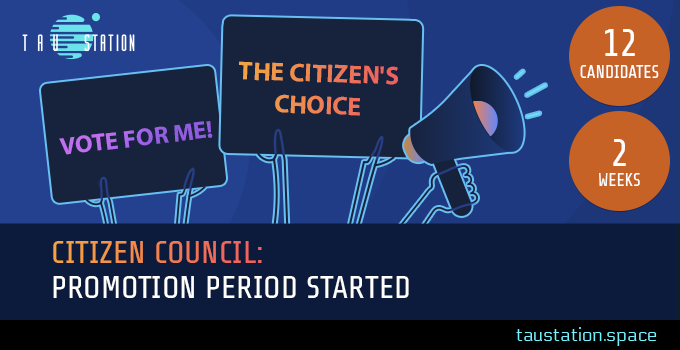 ➔Continue reading "Citizen Council: Promotion Period started"